El Hierro and of El Hierro and plume of volcanic material, 2 Nov 2011. Credit: NASA image by Jesse Allen and Robert Simmon, using ALI data from the EO-1 Team.An underwater volcanic eruption in the Las Calmas (“The Calm”) sea off El Hierro in the Canary Islands continues unabated since last month. The volcano is believed to be spewing up to 330 feet (100 meters) below the surface—yet its 2,200°F (1,200°C) cauldron is heating the surface by as much as 18°F (10°C). 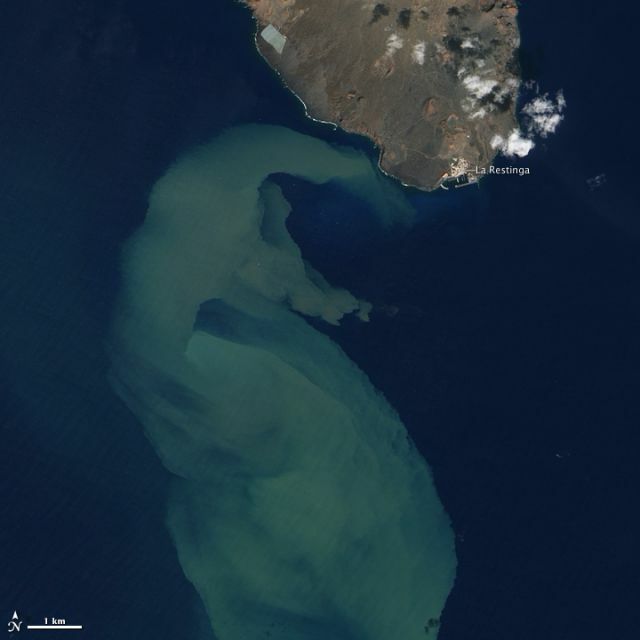 The plume visible in this satellite image stretches tens of miles from the eruption site and is formed from the blasting and churning of seafloor sediment, volcanic rock, and minerals. The eruption has been accompanied by more than 10,000 earthquakes and tremors—including a 4.6 temblor today. Meanwhile Earthquake Reports writes that Spanish scientists announced an eruption is also possible on Lanzarote Island at the far northeastern end of the Canary Island archipelago, and that “an eruption on the coast itself cannot be excluded.” Meanwhile “The Calm” sea is writhing through what may well be the labor pains of a new island.